Travel to Goa, one of India's smallest states. This former Portuguese colony with rich history and sun kissed beaches is now home to thousands of tourists from both India, and the rest of the world. But don't let his put you off, Goa has more to offer than your traditional beach holiday..
Of course most people travel to Goa to experience some of the best beaches in the world, but here is a lot more to Goa than just the beautiful beaches... follow this link for some information about the villages in Goa. 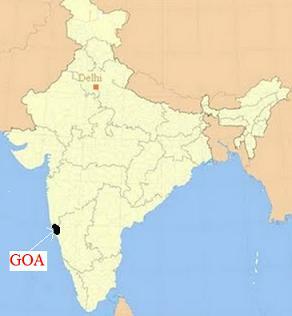 As you can see from this beautiful map, Goa is situated in the western region of India, about 15 hours south of Mumbai. Most routes to travel to Goa from the rest of India arrive into Panaji, the capital. Of course the main reason people travel to Goa is because it has some of the best beaches in India and the world for that matter. There are roughly 28 beaches in Goa, each completely unique unto itself. Of course they all share the same, warm Arabian ocean water and the scorching sun but that is about it. Every beach is different all the way down to the people it attracts, the food, the drink and most importantly the atmosphere, one of the hardest things to get right and also one of the most important when choosing a Goa beach holiday. Here are a list of some of the most popular beaches in Goa with links for more information and loads of pictures. It should be clear to the observant which are more popular than the others. Follow this link for complete information on all of the India beaches. The long, crescent shaped beach at Palolem is the perfect destination for relaxing and watching time go by but finely balanced with excellent parties and happy people. In the far north of Goa is the tiny village of Arambol which boast 16 km of pristine beach. The quiet village can be somewhat overun on Sundays but for the rest of the week Arambol provides a very quiet retreat. Agonda Beach consists of a beautiful and usually fairly empty stretch of white sand and a couple of wooden shacks about 8 miles from the busy Palolem beach. With no more than three cafes and then a huge expanse of untamed coast - if you're lucky you can walk for half an hour without seeing another soul on this stunning beach. 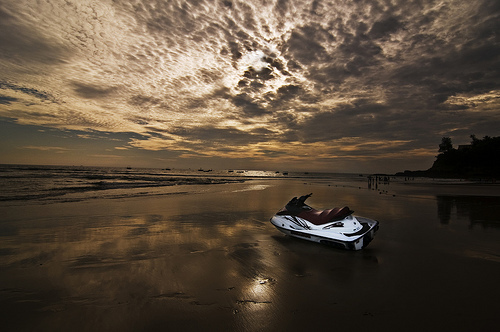 Travel to Goa is complete without a trip to Anjuna! Known affectionately as 'freak capital of the world', Anjuna has been made famous by its gorgeous sandy beach and full tilt, full moon parties. Vagator beach has go to be one of the most interesting beach in Goa with loads of weird and wonderful things going on all the time. Chapora is a great place to just forget the world; the hurried pace of the urban life is easily forgotten and is replaced with strolling, fine dining, swimming and all the other things that involve little work. Colva and Benaulim are two great beach destinations right next door to each other. Benaulim with its quiet little village and deserted beach and then Colva with its watersports, bars and parties. Make sure you check out these places when you travel to Goa! Baga is a quiet fishing village with a flat sandy beach and quiet gentle sea perfect for swimming. For all the beaches of Goa on one page with a brief synopsis of each to help your decision about which beach to go to that little bit easier! Taking your honeymoon in Goa can't help but set you on your path to matrimonial bliss - see how. Of ocurse you may want to consider taking a look atCheap All Inclusive Holidays. The food in Goa is some of the best, most mouth watering and tasty food that you will come across in India. Match that with the most elegant, unique and comfortable restaurants and you will soon be dining in heaven! Goa has got to be the most popular tourist destination in India and mixed with that Portuguese charm and Indian colour makes it impossible not to have a truly unforgettable experience. Check out my select list of hotels to help make you stay in Goa just that little bit more special. Goa consists of around 35 towns and cities but the real heart of this tiny state lies in the 188 villages and hamlets that really gives this place it's heart. Be sure to check out some of the villages when you travel to Goa, they are worth a trip! The tiny city of Panaji is the capital city of the tiny state of Goa. It really is a truly charming city with a small river flowing around one side of the city. If you feel at all that you would like, perhaps just a little bit of culture when you travel to Goa and maybe spend a bit of time away from the parties and the beaches... then anyone I know would recommend you to take a look a small tour of Old Goa. Relax and unwind in paradise with ayurveda. Sooth you body and soul and replenish your energies in this, India's most ancient art! I hope you enjoyed this page and it inspires you to travel to Goa. Please feel free to contact me or leave a comment below, all contributions are welcome.